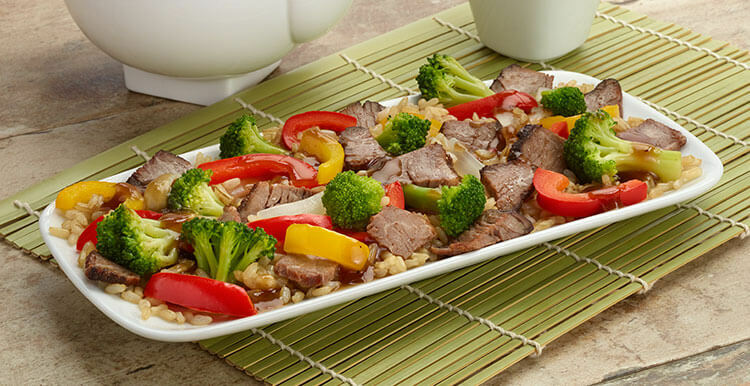 Packed with sizzling flavor, this takeout inspired dish features tender slices of beef and broccoli, in a rich Asian-style sauce, complemented by a medley of yellow and red peppers on a bed of brown rice. Ingredients: COOKED BROWN RICE, BROCCOLI, COOKED SEASONED BEEF AND MODIFIED FOOD STARCH (BEEF, BEEF STOCK, MODIFIED FOOD STARCH, DEXTROSE, SALT, CARAMEL COLOR, SODIUM PHOSPHATE, NATURAL FLAVORING), WATER, YELLOW BELL PEPPER, RED BELL PEPPER, ONION, AND LESS THAN 2% OF SUGAR, SOY SAUCE (WATER, WHEAT, SOYBEANS, SALT, ALCOHOL, VINEGAR, LACTIC ACID), HOISIN SAUCE (SUGAR, WATER, SALT, SWEET POTATO POWDER, RICE VINEGAR, CORNSTARCH, SOYBEANS, SESAME PASTE, SPICES, WHEAT FLOUR, GARLIC, CHILI PEPPER), MODIFIED FOOD STARCH, CANOLA OIL, RESISTANT DEXTRIN, OYSTER FLAVORED SAUCE (WATER, SUGAR, SALT, OYSTER EXTRACTIVES [OYSTER, WATER, SALT], MODIFIED CORNSTARCH, CARAMEL COLOR), SHERRY, TOMATO PASTE, RICE VINEGAR (DILUTED WITH WATER TO 10% ACIDITY), GARLIC (GARLIC, CITRIC ACID), GELATIN, GINGER, YEAST EXTRACT, SEA SALT (SODIUM CHLORIDE, POTASSIUM CHLORIDE), CRUSHED RED PEPPER, CARAMEL COLOR, BLACK PEPPER. Nutrients: COOKED BROWN RICE, BROCCOLI, COOKED SEASONED BEEF AND MODIFIED FOOD STARCH (BEEF, BEEF STOCK, MODIFIED FOOD STARCH, DEXTROSE, SALT, CARAMEL COLOR, SODIUM PHOSPHATE, NATURAL FLAVORING), WATER, YELLOW BELL PEPPER, RED BELL PEPPER, ONION, AND LESS THAN 2% OF SUGAR, SOY SAUCE (WATER, WHEAT, SOYBEANS, SALT, ALCOHOL, VINEGAR, LACTIC ACID), HOISIN SAUCE (SUGAR, WATER, SALT, SWEET POTATO POWDER, RICE VINEGAR, CORNSTARCH, SOYBEANS, SESAME PASTE, SPICES, WHEAT FLOUR, GARLIC, CHILI PEPPER), MODIFIED FOOD STARCH, CANOLA OIL, RESISTANT DEXTRIN, OYSTER FLAVORED SAUCE (WATER, SUGAR, SALT, OYSTER EXTRACTIVES [OYSTER, WATER, SALT], MODIFIED CORNSTARCH, CARAMEL COLOR), SHERRY, TOMATO PASTE, RICE VINEGAR (DILUTED WITH WATER TO 10% ACIDITY), GARLIC (GARLIC, CITRIC ACID), GELATIN, GINGER, YEAST EXTRACT, SEA SALT (SODIUM CHLORIDE, POTASSIUM CHLORIDE), CRUSHED RED PEPPER, CARAMEL COLOR, BLACK PEPPER.